The history of tweezers pre-dates scissors or razors being introduced to Japan and is said to have been originally made of clams. In the 77th stanza of the "Makuranosoushi", it is stated "feeling grateful... for the white metal tweezers that remove hair so well," suggesting that metal tweezers already existed in the Heian period. They eventually made their way to being used by commoners around the Muromachi Period and by the Edo Period, tweezers almost identical in form to those today were in use. The founder of the Kurata Factory, Yonekichiro Kurata, entered the world of making tweezers at eleven years old, when he became an apprentice of a fifth-generation tweezers maker, Kakuhisa Ozawa. 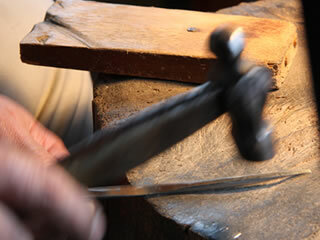 In those days there were many craftsmen who were known tweezers smiths in Asakusa. However, they drastically diminished in number during the Great Kanto Earthquake of 1923 and the Pacific War. In the midst of this, Yonejiro fathered six boys and five girls, with all six boys, including the first-born Fukutaro, entering the world of tweezers craftsmen. In the post-war era, the Kurata family made a name for themselves in the edged tool industry. The second generation Kurata, Fukutaro, apprenticed under Yonekichiro since he was ten years old and eventually learned under the predecessor of a respected shop "Ubukeya" of Ningyocho in Nihonbashi. There he learned the handmade forms passed down from the Edo Period and what is now considered the highest quality products such as "Iroha", "Komaru", and "Hyotan". Living only for his work, he continued to work until the age of 88, two years prior to his passing. 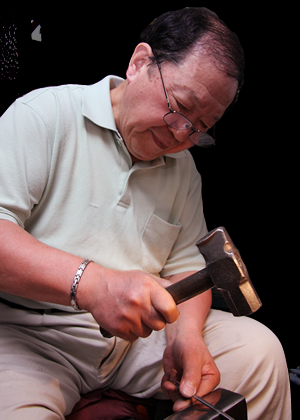 Fukutaro's strong work ethic can be seen in his invention of a special set of pliers to bend a piece of metal for making tweezers or this quote attributed to him,"If the tweezers I made ever hurt you, I am a craftsman after all, I could chop a finger off." My grandfather entered this world in the beginning of the Meiji Era. My father, who was the second in the lineage, apprenticed at "Ubukeya" in Ningyocho, where he honed his skills. I grew up watching my father swing the hammer. During the war, we were evacuated to Niigata, where in my second year in junior high schoool, I began helping out my father at work. When we returned to Asakusa after the war, our house was gone. We built a hut so we could continue working. It was a time of scarcity; whatever we made, we sold. We subcontracted, hired people and sacrificed our sleep to devote ourselves to work, but my father was never harsh with me. One day, we received an order from a silk goods maker in Gosen-city, Niigata, for a pair of tweezers that could fix loose threads in fabrics. "Why don't you make it? ", my father said. What I made without really knowing what I was doing was well liked, and when additional orders came in, I saw my father's happy face for the first time. Later, even the proud craftsman that my father was, would swing his hammer less and less. Eventually, my father, the second, was in charge of the high-quality goods and I, the third, took care of most of the orders. One day, I suffered a liver disease due to exhaustion. I persuaded the doctor who told me I would die if I kept going, and fought the disease while continuing to work on a diet without salt. People often made fun of me as the "man who wakes up the roosters," because I would be up so early to work. My Father passed away when he was 90 years old. He kept making tweezers until the age of 88. What my father, who was my mentor, taught me was "Don't slack off. You can't be careful enough!" With those words in my heart, I've continued to swing my hammer for over 60 years. I am the third generation and turning 82 years old this year. My skills need to be passed on to the fourth, my son Masashi. Lately, there seem to be more people with a love for quality products, which led to an increase in orders. I'm in luck as a craftsman to still be able to work at this age. I think to myself every day, "I'm so happy to be craftsman." Born 1933 as the first son of Fukutaro, his predecessor. In the midst of war, when he was 12, he began helping his father at work, while attending junior high schoool. After graduation, he entered the world of a tweezers craftsman in earnest. 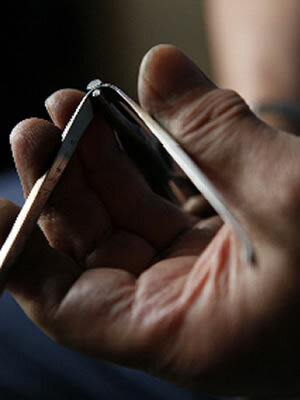 Currently, he is the only heir to the original, handmade style of tweezers making, dating back to the Edo Period. Received the Traditional Craft and Skills Merit Award from the district of Arakawa. 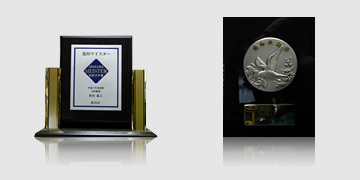 Recognized as Arakawa Meister. Received the Tokyo Mayor's award from the city of Tokyo. Recognized as Tokyo Meister. Born 1964 as the first son of Yoshiyuki. After graduating university, he worked at a women's clothing manufacturer. In 1990, he decided to take over the family business, and is currently inheriting the skills of handmade tweezers making.